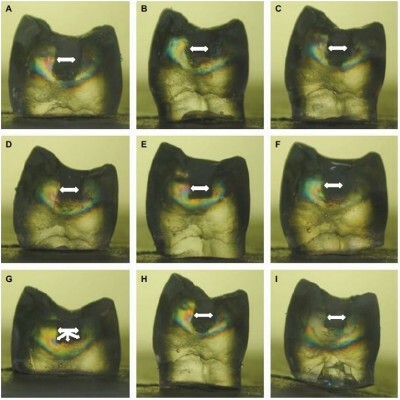 Purpose: This study evaluated the influence of thickness increment on degree of conversion (DC), Knoop microhardness (KHN), and polymerization-shrinkage stress (PSS) by photoelasticity of three dental composites. Methods: For DC and KHN, 45 samples were prepared and divided into nine groups (n=5), according to composite (microhybrid [Filtek Z250 - Z250], bulk-fill flowable [SureFil SDR Flow - SDR], and nanohybrid composite [N’Durance - NDU]) and increment thickness (1, 1.5, and 3 mm). PSS was measured by photoelastic analysis. Composites were placed into a photoelastic model cavity and light-cured. DC and KHN data were subjected to two-way ANOVA and Bonferroni post hoc test. PSS results were qualitatively evaluated through Kruskal–Wallis test. Results: SDR showed the highest DC values. At top and bottom surfaces, the highest KHN was obtained by Z250. Z250 showed higher PSS than SDR in 1.5 mm increments. NDU showed higher PSS than SDR in 3 mm increments. Conclusion: The bulk-fill composite demonstrated better DC and similar KHN and PSS in deeper layers compared to conventional composites. Bulk-fill composites may perform as well as conventional nanohybrid and microhybrid composites.